The Sparmax GP35 Airbrush features a 0.35 mm bore and a spray gun trigger for easy, comfortable airbrushing. Highly versatile, the GP35 comes with interchangeable 7 cc (0.24 oz) and 15 cc (0.5 oz) side feed color cups. The angle of the cups can be adjusted as you work, enabling you to paint at various angles while keeping the color cup horizontal. The GP35 is also equipped with an adjustable preset color flow control so that the amount of color applied remains consistent when the trigger is engaged. 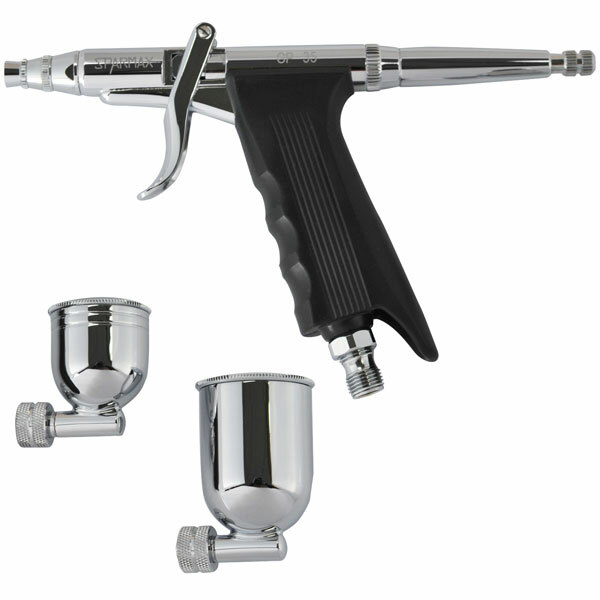 As with every Sparmax airbrush, the GP35 is individually hand-tested to ensure precise atomization and color control. It is backed by a one-year manufacturer's warranty. ® Sparmax is a registered trademark.